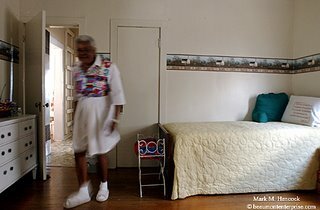 Hattie McClain, 78, moves from her bedroom to the living room at Mama Hager's Christian Home in Beaumont on Wednesday, April 19, 2006. The assisted living house lets a small number of residents live out their final days in loving comfort. 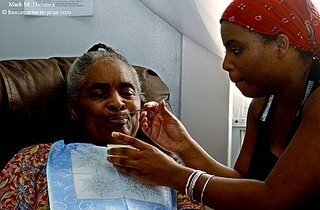 Contractor Miranda Kirkman (right) feeds Earsie Bell McDonald, 77, (left) at Mama Hager's Christian Home. Bernice Dancy, 79, checks on activities in the living room at Mama Hager's Christian Home. 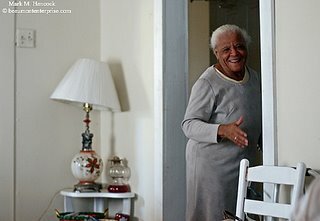 Bernice Dancy, 79, keeps her personal items and treats on her dresser at Mama Hager's Christian Home. Yolanda Duriso, founder of Mama Hager's Christian Home, reminisces at the home in Beaumont. She named the facility after her grandmother, who formerly lived in the residence. 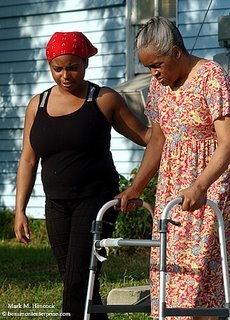 Contractor Miranda Kirkman (right) helps Earsie Bell McDonald, 77, (left) go for a walk at Mama Hager's Christian Home. 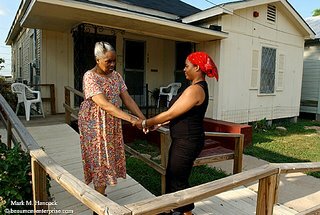 Contractor Miranda Kirkman (right) helps Earsie Bell McDonald, 77, (left) step down from a curb at Mama Hager's Christian Home. Contractor Miranda Kirkman (left) helps Earsie Bell McDonald, 77, (right) go for a walk through the Charlton Pollard neighborhood. Images are part of the Charlton-Pollard series. Larry Carter (left) and Larry Carrell (right) of Malayden perform during the Can-Jam music festival at the Ford Park Barns in Beaumont on Saturday, April 22, 2006. 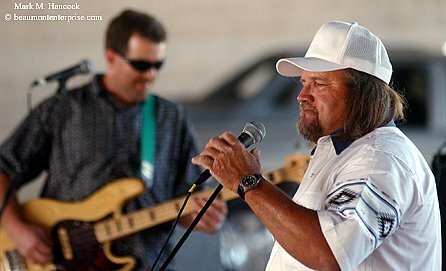 Willie McKusker of McKusker's Last Band performs during the Can-Jam music festival at the Ford Park Barns in Beaumont. Karl Prien of Malayden performs during the Can-Jam music festival at the Ford Park Barns. The Earth Day event benefits the American Cancer Society and was sponsored by The Beaumont Enterprise. Very observant folks out there may have noticed the last five posts were all shot last Saturday. That's how a typical day can be for a PJ. Some days, each assignment can be in a different county. With gas prices being what they are, it can get stressful in many ways. 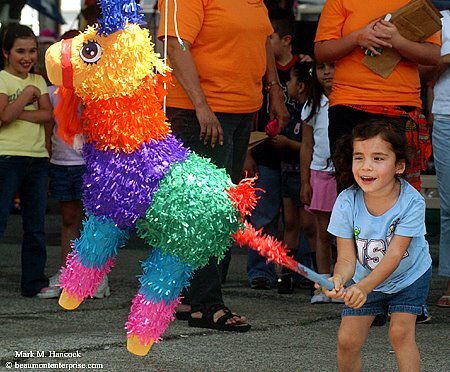 Julia Bellot, 4, of Nederland swats a pinata during the Mercado Days festival in Port Arthur on Saturday, April 22, 2006. The Photobloggies are accepting nominations for the annual award through May 8, 2006. This year, finalists will be judged by a panel of editors from photo magazines. This should make it more interesting than last year's popularity vote. 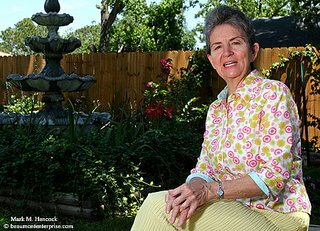 Brenda Choate, 61, poses for a portrait at her home in Port Arthur on Saturday, April 22, 2006. 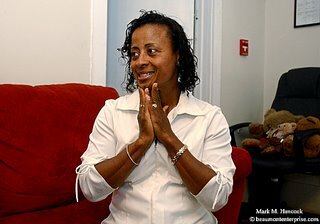 She survived a brutal attack on April 21, 2005 by Gary Sinegal, who was arrested in connection with the deaths of two women in their 80s. Brenda Choate, 61, poses for a portrait at her home in Port Arthur. During the attack, she was kicked in the chin and started to lose consciousness. However, she fought back and eventually escaped certain death. Please read "Year after killings, neighbors stay alert" by Christine Rappleye. 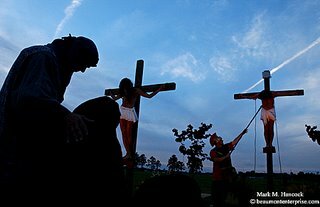 Bands, floats and participants get organized before the Neches River Festival parade in Beaumont on Saturday, April 22, 2006. 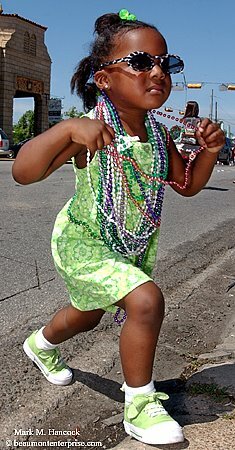 (Left) JaNasea Stoker, 2, of Beaumont runs after some overthrown beads during the Neches River Festival parade. (Below) Ozen High School students lead the band down Calder Avenue during the Neches River Festival parade in Beaumont. Kelly High School junior Lauren Munro (right) prepares to board the Beaumont Heritage Society float before they ride in the Neches River Festival parade. "Rita," Lamar University 's civil engineering team's concrete canoe, awaits competition before races at Boomtown USA in Vidor on Saturday, April 22, 2006. 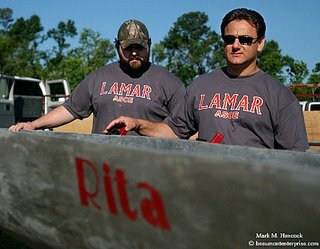 The team named their canoe Rita because of the influence Hurricane Rita had on their studies and the project. Lamar University Civil Engineering junior Daniel Gossett and adjunct professor Hani Tohme inspect "Rita," the team's concrete canoe, before races at Boomtown USA. 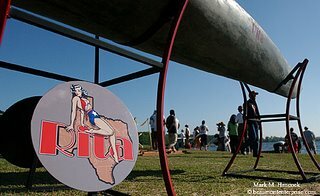 The event was sponsored by the Texas/Mexico Regional American Society of Civil Engineers and hosted by Lamar University. 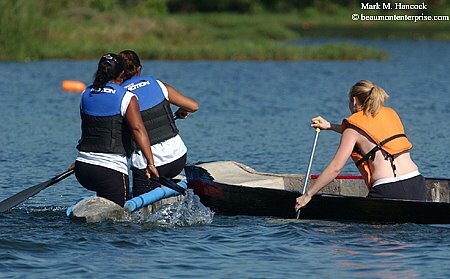 Lamar University's Erin Watson (left) and Stacy Marhofer (right) paddle to 2nd place in their heat during the concrete canoe races at Boomtown USA. The winning team advances to national competition. 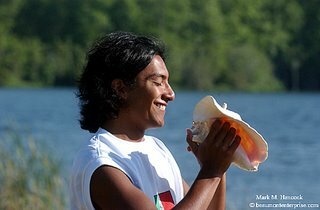 Noe Gallegos of the Autonomus National Univeristy of Mexico (UNAM in Spanish) takes a break from blowing through a shell during the concrete canoe races at Boomtown USA. 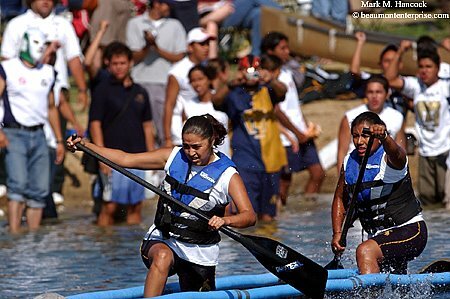 Texas Tech's Amanda Felderhoff (right) continues paddling as her team's concrete canoe rams the canoe of UNAM's Kati Cruz Ruiz (left) and Nohemi Monroy Ceja (center) during the cement canoe races at Boomtown USA. UNAM teammates cheer as Kati Cruz Ruiz (left) and Nohemi Monroy Ceja (center) paddle their concrete canoe to a heat victory during the cement canoe races at Boomtown USA. 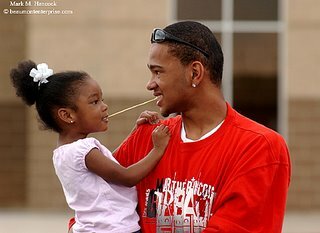 Madison Fontenot, 3, has a tug-of-war over a straw with her uncle Darius Bassett before watching the Dora the Explorer show at Ford Park in Beaumont on Friday, April 21, 2006. An excited Gage Gilliam, 3, (top) rides the shoulders of his grandfather Randy Seuge (bottom) as they wait in line before the Dora the Explorer show at Ford Park in Beaumont. Dora and her friends decide to have a fiesta during "Dora's Pirate Adventure" at Ford Park in Beaumont. 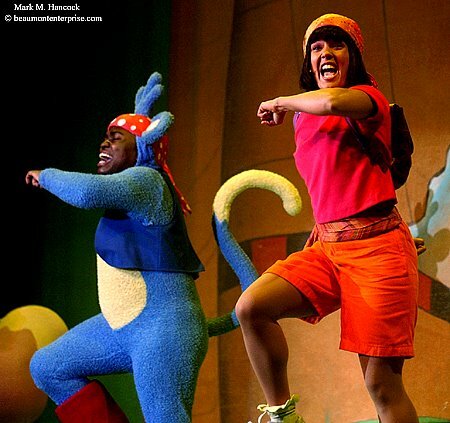 Dora (right) and Boots, her monkey friend, (left) sing and dance during the Dora the Explorer show at Ford Park in Beaumont. 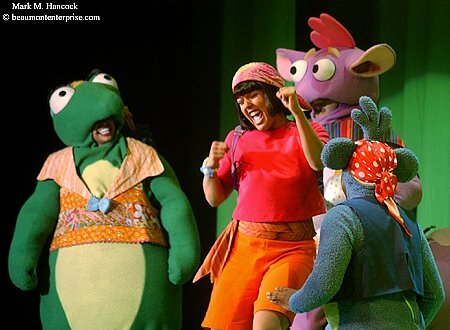 Please read "Treasure trove of surprises" by Melissa Renteria and "Vamos!" by Rolando Garcia. (Left and below) Callie Ferguson poses for a portrait at Kountze High School on Thursday, April 20, 2006. 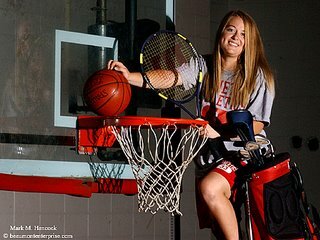 She has qualified for regionals in golf, tennis and basketball. She is also on the school's softball team. 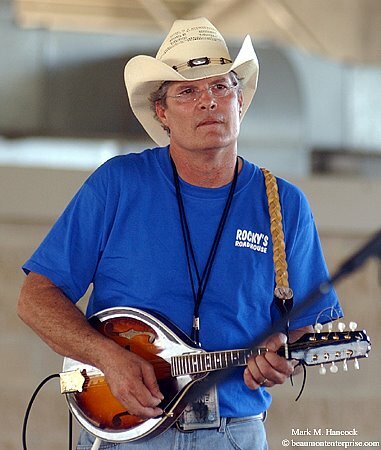 I know some folks over at Burnt Orange visit this blog. If the University of Texas (UT) still has some Title IX openings, here's your girl. 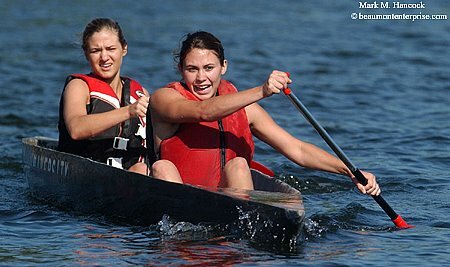 She's unsigned, a good all-around athlete, works well with media and is fearless. Please read "All-around athlete" by Johnnie Walters. 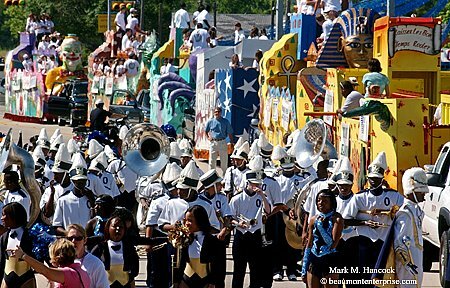 During today's Neches River Festival parade in Beaumont, all three Beaumont ISD high schools will perform. Each is easily identified by their uniforms and marching style. Ozen High School drum majors Marcus Gordon (left) and Leon Nolan (right) pose for a portrait at the high school in Beaumont on Thursday, April 13, 2006. 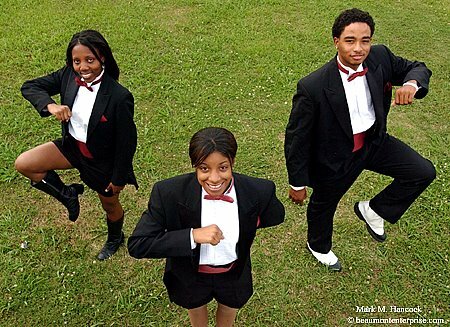 Ozen is known for its high stepping and back-bending drum majors. Central High School drum (left to right) Whitney Joseph, Ashlie Holmes and Chase Patten pose for a portrait at the high school in Beaumont. Central is known for its high knee stepping. 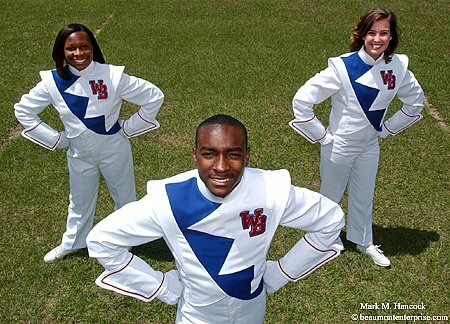 West Brook High School drum majors (from left to right) Megan Clark, Jonathan Pugh and Jayne Boykin pose for a portrait at the high school in Beaumont. West Brook is known for traditional heel-toe steps. 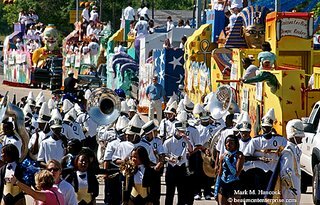 To learn more about these bands or the parade, please read Marching along, tootin' horns by Jamie Reid. 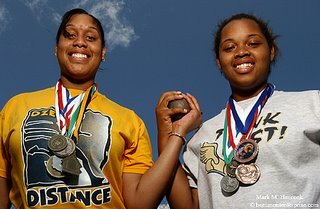 Ozen High School shot putters Keisha Hester (left) and Crystal Blue (right) pose for a portrait at the school on Friday, April 21, 2006. Hester won first and Blue won third to qualify for regionals. Sertinos Cafe owner and manager Cliff Hilton laughs with contractors at the cafe in Beaumont on Wednesday, April 12, 2006. Hilton said he has spent thousands on artwork and custom flooring at the upscale cafe. The cafe will offer free Wi-Fi and plans to open around May 1, 2006. Sertinos Cafe owner and manager Cliff Hilton (right) meets with Lola Castro, a small business relationship manager with Chase Bank, (left) at the upscale cafe in Beaumont. 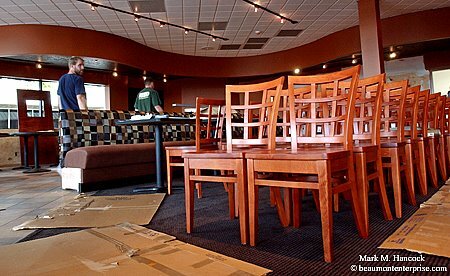 Contractors continue preparations at Sertinos Cafe in Beaumont. 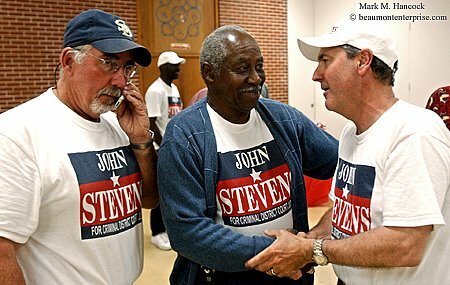 Jim Wright of Bevel Oak (left to right) gets elections results as Willie Scott of Beaumont congratulates John Stevens, Jr. as the election is called in his favor during an election party for Stevens at the Pipefitters 195 Hall in Nederland on Tuesday, April 11, 2006. Stevens won the Criminal District Court judge primary runoff election. 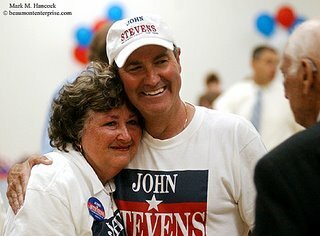 John Stevens, Jr. is congratulated by his mother Nell Rudiger during an election party for Stevens at the Pipefitters 195 Hall in Nederland. Incidentally, this is his dad and his daughter is local KFDM-TV on-air news reporter Kara Stevens. Idolina Escamilla Gonzalez (left) prepares shrimp as she talks with her God daughter Christin Carter, 15, (right) before a Good Friday meal for the extended family at her home in Beaumont on Friday, April 14, 2006. 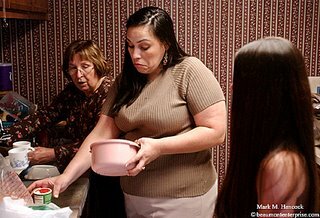 Idolina Escamilla Gonzalez (center) gets help from her mother Lucila Escamilla (left) and God daughter Christin Carter, 15, (right) as they prepare a Good Friday meal. "Gonzalez said she can sympathize with immigrants who are desperate to come to the United States at any cost. She doesn't condone them breaking the law to get here, but she does understand their desperation." 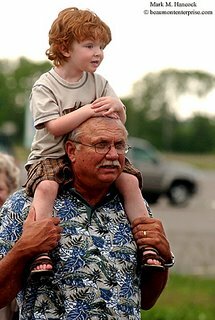 Images are part of the faces of immigration series. Immigration is a pressing issue. Much of the debate involves illegal immigration from Central America. However, the United States is the melting pot of the world and includes legal immigrants from around the planet. Whatever decisions are eventually made affect all immigrants. 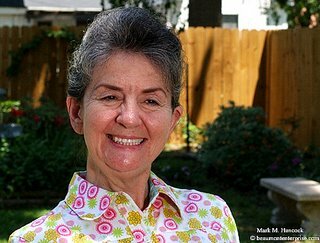 This page links to images of immigrants from around the world and their contributions to other Texans. A catbird (Dumtella corolinensis) rests at The Boy Scout Woods Bird Sanctuary in High Island on Thursday, April 21, 2005. As of today, I've been a staffer at The Beaumont Enterprise for one year. Typically, folks look back on anniversary dates and list accomplishments. I've gotten some awards for my work and tried to help some folks this year. However, I didn't accomplish enough nor help enough folks. As such, I have much to improve. 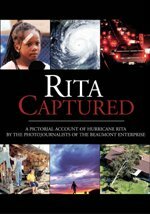 I suppose Hurricane Rita blew away any laurels I might have rested on. I'll do better this year. Curtis Jacobs with Hi-Tech Electrical & Maintenance of Beaumont installs a new traffic signal near the Crockett Street Entertainment District in Beaumont on Thursday, April 6, 2006. 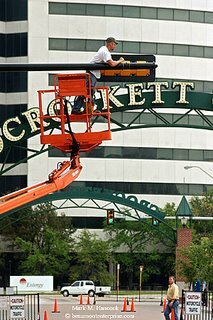 New signals and additional lighting are being installed in the area as safety precautions. I'm posting this information two ways. This condensed post is for folks who trust my advice and/or already understand spreadsheets. For the folks who want to understand the minutia of this advice, please read the extended version of this post. Balance your checking account. Create a new spreadsheet with the following column headers: Date, Check number, Amount, Transaction, Balance, one titled "B," Cleared and Category. Use this formula in the Balance column: =E1-C2. Fill Down the formula for two screens. Create a template below this area (at the bottom of the spreadsheet) for fixed and variable expenses arranged by due date. Add all predictable income without dates (use negative numbers). Copy and Paste three or more copies of the template into the active portion of the spreadsheet. Adjust entries by real dates. Insert other anticipated income and expenses by date. Use real numbers for expenses and bracket income behind Transactions until actually received. Group expenses under each predictable income. Insert two rows between each grouping. This is your three month financial projection. Add all real expenses and incomes (as received) along with supporting data. A copy of this information can be Saved As a new name for your annual tax preparation spreadsheet. Look for the first negative number. Note the date and amount. This amount of money must be earned by the date notated. Otherwise, it's time to find a new biz. 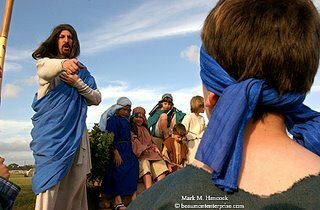 A Roman soldier drives a spear into the side of Jesus, played by Michael Campbell, during the Last Days of Christ reenactment at Cathedral Christian High School in Beaumont on Saturday, April 15, 2006. 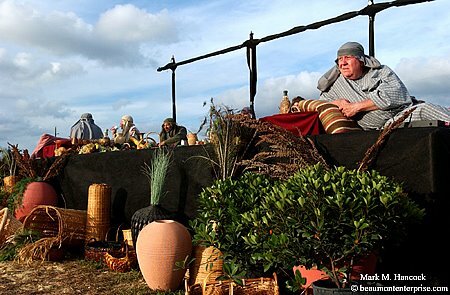 An apostle, played by Mike Tanner (right), waits for a new group of guest to arrive at the Last Supper station during the annual Last Days of Christ reenactment. Noah, played by Woody Barton, selects children to play animals during the Last Days of Christ reenactment. Different stations at the annual event taught different Biblical lessons. Please see Fayrouz's images as well. Although this post is intended for PJs, anyone with income and expenses can use this information to handle their personal finances. I'm posting this information two ways. This expanded post is for folks who want to understand the minutia of this advice. For folks who trust my advice and/or already understand this info, please read the condensed version of this post. PJs are notoriously adrenaline junkies and risk takers. It's best to save this behavior for the job and extreme sports rather than paying rent. Many new PJ graduates find themselves unprepared to face financial survival realities. 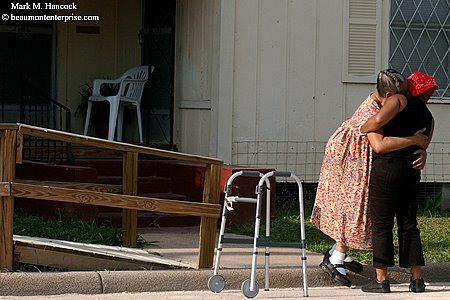 They can balance a checkbook, but haven't been taught how to look forward with their finances. Working pros may find their biz is more like a series of fad diets with yo-yo results. Some staffers also live paycheck to paycheck with no break in sight. This post should help level things out, but might make some folks realize this isn't their particular dream job after all. I've seen a few commercial photographers graduate and launch immediately into the field with a business plan and become wildly successful. I've seen similar situations where a photographer eventually landed a job at a drug store making prints for other folks to make ends meet (and losing paying gigs as a result). Obviously, talent and tenacity were two major reasons for the discrepancies. 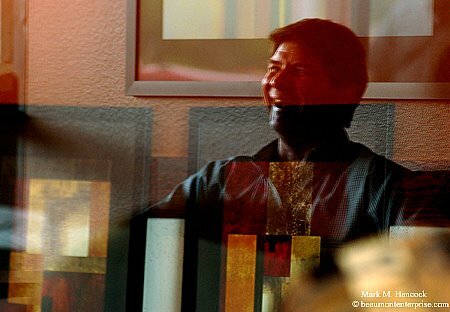 However, a flawed business plan, a direction change or lack of confidence might cause similarly-trained photographers to land in such different situations. Most likely, it was simply a matter of not understanding how pennies and dollars work. Since taxes are due, now might be a good time to make a plan to survive in this biz. Before anyone gets too excited, understand this plan isn't a way to wealth and success. It's a way to determine if a PJ is staying in this field for another three months or needs to go back to the "real world." It's harsh, but realistic. The following is a somewhat intimidating process. Most PJs hate working with real numbers, but it's worth it. Take this process one step at a time and it works out. I don't know a single person who unpacked their first camera and immediately shot an award-winning portfolio. Although it's best for (primarily freelance) PJs to have enough cash to last at least six months without a gig, newer PJs and staffers can use a three month crystal ball. But, build up the buffer zone as quick as possible. 1) Level out cash flow. 2) Make tax preparation easier. PJ work is financially misleading. On paper, it looks incredibly lucrative. All shooters start out prepared and passionate enough to work 20-hour days. On paper, a great shooter can earn $500 or more per hour. So, the math indicates a new graduate should earn about $70K their first week. Furthermore, they should be able to retire to Cancun in about 10 years. Right? Most starting PJs are lucky if they find enough work to scrape up $200 to $500 per week. If they're really lucky, their invoices might be paid in two weeks to a month. Consequently, even the best-qualified, hardest-working new PJ could be out of business within two months. Some great shooters use credit cards to make it through the first month. Then, they get flooded by checks from all their hard work. But, at the end of the second month, they're considering day-labor construction jobs. Credit card bills and living expenses ate most of the income. The large payments gave a false sense of security to the PJ, who slacked off as the well ran dry. Simply stated, lack of planning combined with unpredictable pay patterns can crush egos and careers. Everyone's income is a series of peaks and valleys. Freelancers face Mt. Everest and Mariana's Trench while staffers try to make it paycheck to paycheck. By leveling out cash flow, most PJs can reduce the manic nature of this biz and might have a chance at some family time and/or a key lime pie some healthy food. Although freelancers have the most erratic payment situations, staffers need to take a long look at their cash flow or they'll spend more time looking at the classified ads than at Page 1 options. We've already talked about using a spreadsheet to give info to CPAs before tax day. By using a spreadsheet throughout the year for all financial records, the end-of-year preparations can be completed in about an hour. There are several spreadsheet programs available. Most are capable of simple math formulas and complex analysis of financial patterns. Use whatever program is handy, but a simple calculation function with at least five columns (list/grid view) is all that's needed. We're going to use the spreadsheet not only to track income and expenses as they happen, but we'll see what will happen in the future. This way, we can make changes and affect the outcome before it's too late. We need to set up a spreadsheet to balance and understand our finances. I'll stick with generic enough information to work on all spreadsheets. Set up the spreadsheet columns with the following headers: Date, Amount, Transaction, Balance and one titled "B." Additional columns for check number and cleared, notes and category could be added to round out a useful basic spreadsheet. In this example, "Transaction" normally lists who was paid or who needs to pay. "B" is a notation for "business expense." We'll discuss it's use later in this post. The math on this spreadsheet is equally simple. Leave an extra row at the top of the sheet. In the balance cell of the second row, enter the following math formula: =E1-C2 (or similar depending how columns are arranged). The formula subtracts a new amount (in the 3rd cell of the second row) from the previous total (in the 5th cell of the 1st row). The point is to have new amounts be deducted from the previous total. Select two screens of cells in the balance column below this formula and fill down. This sets up all the math and programming needed. The rest is simple data entry. Save this spreadsheet to a secure location and place a shortcut on the desktop (if on a home computer). An unused financial spreadsheet is literally useless. If done daily or as needed, it takes about three minutes each day. If done weekly, it might take five or 10 minutes. Waiting to compile all this info at year's end takes much longer and doesn't help PJs stay in the biz. To use the spreadsheet, we need to enter data (information). Data entered are either fixed (already happened or will happen) or flexible (adjusts based on cash availability or need). If a PJ is starting from scratch, simply balance the checking account and enter the total cash available today after all outstanding expenses are paid in the first row. Later, fill in the missing information to the beginning of the year to make this useful for taxes. BUT, don't calculate previous amounts into the total because it'll change the balance. A monthly template lists all predictable income and expenses. At the beginning of the month, this template is copied, inserted and adjusted by date into the budget. Then, calculations are filled into the appropriate column. We'll talk more about stacking templates later. For now, let's build the basic template. At the bottom of the spreadsheet (below the calculations), enter each fixed expense. Fixed expenses are the same amount each month. These often include newspaper subscriptions, rent, fixed utilities, loans, car payments, insurance, regular charities, internet accounts, cable TV and all other bills. If these expenses are directly withdrawn, indicate the date (for example, "/15" for the 15th of each month). Otherwise, subtract seven days from the normal due date and list this number in the date column. Next, enter all regular variable expenses. Variable expenses change monthly based on use. Variable expenses often include utilities, phones (cell and home), and credit cards. Use the highest common predictor for these expenses and round the number up. For example, use $200 for electricity if it ranges from $154 to $191 monthly. In addition to these expenses, add other budgetary expenses. These include oil changes / car repairs, food, gasoline, medical expenses, haircuts, equipment, clothes, extra payments toward loans, savings and entertainment. Again, assign the highest probable number to these amounts. Arrange all these expenses by payment date (insert row, copy, paste). These entries make the basic budget. The point of this budget is to predict and list all possible expenses. Then, unexpected expenses can happen without causing catastrophic (career-ending) financial damage. Next, list all predictable income sources. Due to the formula we're using, these are listed as negative numbers. A predictable paycheck of $850 would be listed as -850 in the cell. The end result reflects a positive number because a balance minus a negative number is a positive number ($5 - - $9 = $14). If staffers are paid biweekly, they should list pay twice per month without a date around the 1st and 15th. They might also list mileage, however don't assign an amount. Simply leave it blank with the mileage predictor. Regular royalty checks, settlement payments, trust fund allowances (it's possible) or anything else that is absolutely predictable can be included. 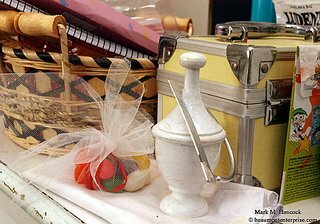 The end result should be an approximate template of a PJ's expected expenses and incomes. After these entries, feel free to add other quarterly or annual expenses (both fixed and variable). I include a NPPA membership, magazine subscriptions, car inspection and license, birthdates, anniversaries and so forth with expected expenses. Quarterly and annual expenses are included as those months are added to the budget. We'll use a three-month budget for this example. If folks have the cash, stretch this out as long as reasonable or until it becomes depressing. Make enough rows in the active spreadsheet (the part with the formula) to insert the monthly templates. Paste the templates and adjust the dates to reflect real dates (for example change "/15" to 4/15) for three months. Staffers change paydays to the actual dates and adjust accordingly. Add any quarterly or annual expenses and place them in the appropriate location. By now, most folks should be wondering where to put other income to make the numbers positive again. Non-predictable income can only be added once it's in hand. Because it's only potential income until it's received. However, once a reimbursement (mileage) voucher or a freelance invoice has been sent, it can be notated on the budget. Any sent invoices can be assigned a reasonable estimated pay date (30 days is reasonable for newspapers, 60 days for corporations and 90 days for magazines). Place a notation on the appropriate date in the transaction column. However, don't put the amount in the amount column until it's in hand. Instead, place it in brackets behind the transaction name. An example would be "XYZ magazine (-400)." This lets a PJ know a $400 invoice is expected on this date. However, if something goes wrong, the PJ isn't trying to sell all his/her bodily fluid/spare parts to make a car payment. The additional benefit of this system is it reminds the PJ to send late and/or license renewal notices in a timely manner. If a payment is expected after 30 days and it's not paid, the PJ adds the interest (per contract) and sends a new invoice and/or late notice to the client. Staffers can estimate when reimbursement checks should be paid. Place a notation on the appropriate date in the transaction column. However, don't put the amount in the amount column until it's in hand. Instead, place it in brackets behind the notation. An example would be "Mileage (-800)." This lets a PJ know an $800 mileage reimbursement is expected on this date. If something goes wrong in accounts payable, the PJ might have a chance to juggle the numbers rather than suffering a major accounting nightmare. When PJs find they're slightly ahead of the curve, they should move future fixed expenses above the current date. For example, move a May car payment into April. This makes less funds available. Should something horrible happen, move the expenses back to where they belong and cover the emergency. I often panic while I still actually have plenty of money in the bank. However, these occasional panic attacks spur me to make enough money to keep doing what I love. The point is to keep ahead of expenses. If PJs get too close to the line one month, they can replace budget numbers with real numbers. An actual energy bill might be $50 less than the budgeted amount. This could be enough to pay a different bill or get some food. PJs often need want expensive equipment. To afford these purchases without using a credit card, group the purchase with paid invoices. A lens may cost $1,500. However, it isn't a required purchase while rent is due. To afford the lens, insert the projected cost into the budget below the actual date. Move paid freelance gigs directly below the entry rather than placing them in the current balance. These paid invoices are immediately absorbed by the lens cost. 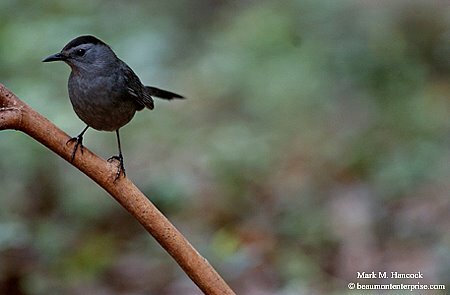 When the balance moves into positive territory below the lens, it's time to buy the lens. There are two advantages to making purchases this way. 1) No finance charges are paid to a third party. 2) Should an emergency arise, these payments can be moved to where they actually belong to cover the unexpected expense. Above, we said "B" is a notation for "business expense." In the column, it's notated with a simple asterisk (*). In addition to expenses paid with checks and debit cards, we can add cash payments to the spreadsheet. To keep from confusing ourselves and our bank balance, enter the transaction name. Behind the business name, enter the amount in brackets and notate the check number column with "cash." This translates to a cash entry for a $4.50 business meal at Taco Shack on April 15. It takes very little work to change this into something the CPA understands. On January 1, take the entire spreadsheet and Save As a new name (2006taxes for example). Then, delete all entries that don't have asterisks. If PJs have spent their time wisely, they can prepare their complicated taxes for the CPA in less than an hour. How? These PJs can plop the notated entries into a database program, sort it by category, paste the result back into the 2006taxes spreadsheet, separate the categories and they're ready. As soon as they get all their 1099s and W-2s, they ship the package off to a CPA and should expect a return within two weeks. Now do folks understand why I'm writing such a complicated post while most of y'all are sweating your taxes? Most pro PJs won't touch a one-time-use mug shot for less than $150. They understand the Cadillac Theory. 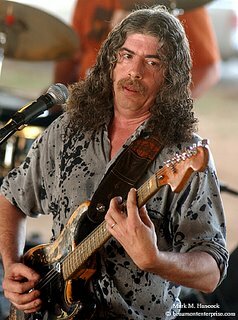 Consequently, they aren't overly concerned about low-end gigs. They're confident in their abilities and charge appropriately. On the spreadsheet we've created, look for the first negative number. Note the date and amount. This amount of money must be earned by the date notated. Otherwise, consider this date as the final work day for a PJ. PJ work isn't for everyone. Many fine PJs can't handle the financial demands. The folks who can - regardless of their shooting ability - get to stay in the biz. Those who can't make a profit should seriously consider work in another field. The problem with PJs staying in the field without making a profit is that they're taking potential jobs from other borderline PJs. Consequently, two PJs can't make a living while one could. This also makes supply higher than demand, drives down prices and compounds a bad situation. This situation is most pronounced in large-market cities. If a PJ - for whatever reason - can't get enough gigs to make a living, please step aside. Don't start signing rip-off contracts out of desperation and embolden publishers to force bad deals on other PJs. Meanwhile, I understand it's hard to hang up the cameras. If a "retired" PJ does work after leaving the biz, please charge appropriately to keep the price high enough to let new PJs have a chance. It's fine to shoot your own kiddos participating in events. It's not appropriate to give the photos away if other PJs are covering the event. It's flat wrong to solicit free shoots "just to keep a hand in the biz." 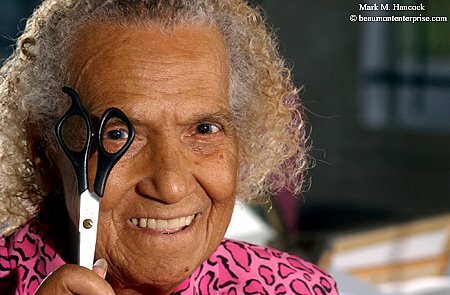 Abbie Dugard, 84, looks through some scissors as she poses for a portrait at Perry's Barber Shop and Beauty Salon in Beaumont on Thursday, April 13, 2006. Dugard was recognized by the State Board of Barber Examiners for her more than 60 years of work in the business. 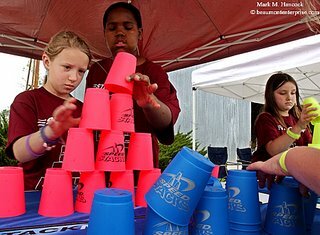 Jean Few Primary School 3rd-grade students Alex Richardson (from left to right), Trenten Watts and Courtney Hillebrandt practice their cup stacking skills during the 3rd annual Jasper Air Show in Jasper on Saturday, April 1, 2006. The students were raising donations to attend the world speed stacking championships in Denver. 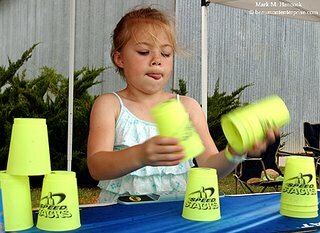 Jean Few Primary School 1st-grader Anna Seale practices her cup stacking skills during the 3rd annual Jasper Air Show in Jasper. Memorial High School "Word of Mouf" member Alexcha Bell prepares the school for "National Kick Butts" Day at Memorial High School in Port Arthur on Tuesday, April 4, 2006. 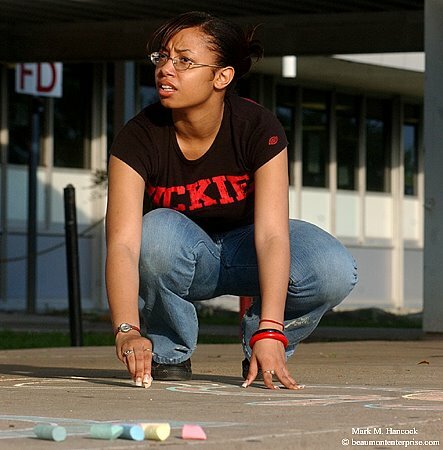 The event is intended to remind students that 1,200 Americans die each day from smoking-related diseases.